The Sign of the Cross is a Christian ceremony that represents the Passion of our Lord by tracing the shape of the Cross with a simple motion. It is a ceremony, I say, and here is what is meant by that term. A skillful manager assigns to each of his subordinates his proper task, making all of them useful, not only those who are vigorous and energetic, but also those who are less so. Similarly, the virtue of religion, hav­ing for its proper and natural work to render to God the honor that is His due, draws up each of our virtuous ac­tions into its own work by directing them all to the honor of God. Religion makes use of faith, constancy, and tem­perance for the good deeds of testimony, martyrdom, and fasting. These actions are already virtuous and good in themselves; religion merely directs them to its particular intention, which is to give honor to God. Yet not only does religion make use of actions that are in themselves good and useful; it also employs actions that are indiffer­ent or even entirely useless. In this regard the virtue of re­ligion is like that good man in the Gospel (Matt. 20:6–7) who hires the lazy and those for whom others had found no use to work in his vineyard. Indifferent actions would remain useless if religion did not employ them, but once put to work by it, they become noble, useful, and holy, and henceforth capable of earning their daily wage. This right of ennobling ac­tions which if left to themselves would be only common and indifferent belongs to religion, the princess of the virtues. It is a sign of her sovereignty. It is religion alone that makes use of such actions, which are — and are prop­erly called — ceremonies as soon as they enter into her service. Truly, inasmuch as the whole man with all of his actions and belongings ought to give honor to God, and inasmuch as he is composed of soul and body, interior and exterior, and in the exterior there are indifferent actions, it is no wonder that religion — having the duty to sum­mon man to pay this tribute — demands and receives in payment exterior actions, indifferent and bodily though they be. Let us consider the world at its birth. Abel and Cain made their offerings (Gen. 4:3–4). What virtue called upon them to make these offerings if not religion? A little while later, the world came forth from the ark as from its cradle, and without a moment’s delay an altar was arranged and several animals were immolated upon it in a holocaust whose sweet odor was received by God (Gen. 8:18–21). In train there followed the sacrifices of Abraham (Gen. 12:8; 13:18; 22:13), Melchizedek (14:18), Isaac (26:25), Jacob (28:18; 33:20; 35:14), and the change and washing of the clothes associated with it (35:2–3). The greater part of the Law of Moses was taken up with ceremonies. Let us now come to the Gospel. How many ceremonies do we see there in our sacraments (Luke 22; John 3), in the healing of the blind (Mark 8), the raising of the dead (John 11:35–44), and the washing of the Apostles’ feet (John 13:4–5)? This article is from “The Sign of the Cross.” Click on image to preview or order. Some will say that in these things God did what He pleased and that no consequences for our practice can be inferred from them. Yet here is St. John baptizing (Mark 1:4), and St. Paul having his hair cut in accord with a vow (Acts 18:18) and then praying on his knees with the church in Miletus (Acts 20:36). All of these actions would have been sterile and fruitless in themselves, but employed in the work of religion they became honorable and effica­cious ceremonies. Now here is what I have to say: the Sign of the Cross of itself has neither strength, nor power, nor any quality that merits honor, and, furthermore, I confess that “God does not work by figures or characters alone,” as the au­thor of one treatise says, and that “in natural things the power proceeds from the essence and quality of the thing, while in supernatural things God works by a miraculous power that is not attached either to signs or to figures.” But I also know that God, in making use of His miracu­lous power, very often employs signs, ceremonies, figures, and characters, without attaching His power to those things. Moses touching the rock with his staff (Exod. 17:6, Num. 20:11), Elisha striking the water with Elijah’s coat (2 Kings 2:14), the sick having recourse to St. Peter’s shadow (Acts 5:15), to St. Paul’s handkerchiefs (Acts 19:12), or to the robe of our Lord (Matt. 14:36), and the Apostles anointing the sick with oil (Mark 6:13): what were these other than pure ceremonies, which had no natural power and were nevertheless employed unto miraculous ends? Is it necessary for us to say that the power of God was tied down and bound to these ceremonies? On the contrary, it would be more fitting to say that the power of God, by making use of so many different signs and ceremonies, shows that it is not bound to any one of them alone. Five points have thus far been made. First, the Sign of the Cross is a ceremony. In its natural quality a cross-like motion has nothing in it that is either good or evil, praiseworthy or blameworthy. How many times is such a motion made by weavers, painters, tailors, and others, whom nobody honors or troubles for it? It is the same with the cross-like shapes and figures that we see in ev­eryday images, windows, and buildings: these crosses are not directed to the honor of God or to any religious use. Yet when this sign is employed so as to give honor to God, even though it be indifferent in itself, it becomes a holy ceremony, one that God uses to many good ends. Second, this ceremony is Christian. The Cross, to­gether with all that it represents, is folly to the pagans and a scandal to the Jews. Under the Old Law and under the law of nature, the death of the Messiah was heralded in different ways, but these signs were only shadows and confused, obscure marks compared with those we now use, and, moreover, they were not the ordinary ceremonies of the Old Law. 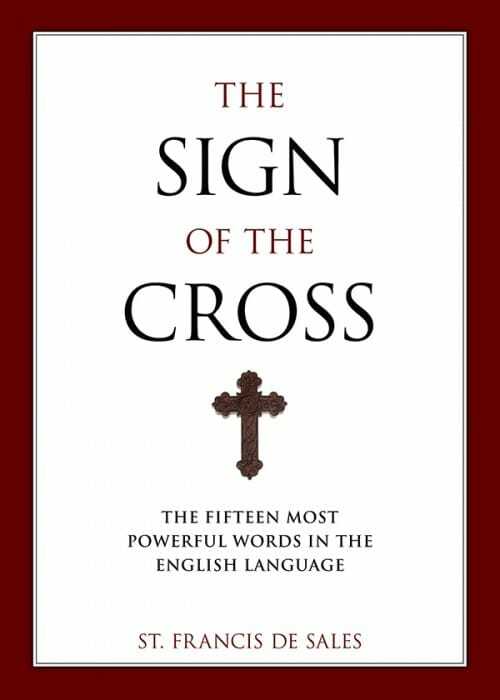 The pagans and other infidels have also sometimes made use of this sign, but as something bor­rowed, as a sign not of their religion but of ours, and in this way the traitor himself confesses that the Sign of the Cross is a mark of Christianity. Third, this ceremony represents the Passion. In truth, this is its first and chief end — that upon which all the others depend and which serves to differentiate it from several other Christian ceremonies that serve to repre­sent other mysteries. Fourth, it represents the Passion by making a simple motion, which is what differentiates the Sign of the Cross from the Eucharist. For the Eucharist represents the Pas­sion by the perfect identity of the one who is offered in it and the one who was offered on the Cross, which is none other than the same Jesus Christ. The Sign of the Cross, however, represents the Passion by a simple motion that reproduces the form and shape of the Crucifixion. Fifth, the Sign of the Cross consists in a motion, which is what differentiates it from permanent signs, engraved or marked out in enduring materials. As a rule, the Sign of the Cross is made in the follow­ing way. It is made with the right hand, which, as Justin Martyr says, is esteemed the more worthy of the two. It is made either with three fingers, in order to signify the Blessed Trinity, or five, in order to signify the Sav-ior’s five wounds; and although it does not much matter whether one makes the Sign of the Cross with more or fewer fingers, still one may wish to conform to the com­mon practice of Catholics in order not to seem to agree with certain heretics, such as the Jacobites and the Ar­menians, who each make it with one finger alone, the former in denial of the Trinity and the latter in denial of the two natures of Christ. The Christian first lifts his hand toward his head while saying, “In the name of the Father,” in order to show that the Father is the first person of the Blessed Trinity and the principle and origin of the others. Then, he moves his hand downward toward the stomach while saying, “and of the Son,” in order to show that the Son proceeds from the Father, who sent Him here below into the Vir-gin’s womb. Finally, he pulls his hand across from the left shoulder to the right while saying, “and of the Holy Spirit,” in order to show that the Holy Spirit, being the third person of the Blessed Trinity, proceeds from the Father and from the Son and is Their bond of love and charity, and that it is by His grace that we enjoy the ef­fects of the Passion. Editor’s note: This article is adapted from a chapter in St. Francis de Sales’ The Sign of the Cross, which is available through Sophia Institute Press.